Who Qualifies as an Unaccompanied Alien Child (UAC)? “Unaccompanied alien children” (UAC) are defined in U.S. law as children who cross our borders and (1) have no lawful immigration status in the United States, (2) have not attained 18 years of age, and (3) have no parent or legal guardian in the United States or no parent or legal guardian in the United States who is available to provide for their care and physical custody. What are the Root Causes of their Flight? Violence: While poverty and the desire to reunify with family to attain security are ongoing motivations to migrate, violence in the home and at the community and state levels is a primary factor forcing children to flee El Salvador, Honduras, and Guatemala (the Northern Triangle of Central America). Instability: Many children are left vulnerable and unprotected as local violence exacerbates the lack of economic and educational opportunities, leading to stress on the family unit and family breakdown. Lack of State Protection: The Northern Triangle governments fail to adequately protect children due to corrupt or inadequate law enforcement legal systems, and limited social welfare and child protection infrastructure. How Many UAC are Arriving? 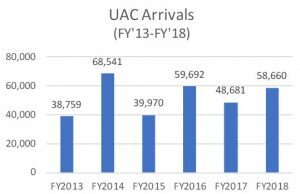 Apprehension, Screening, and Transfer: UAC are typically apprehended by the Department of Homeland Security (DHS), most often at the U.S./Mexico border by U.S. Customs and Border Protection (CBP). Generally, DHS is required to notify and transfer custody of the unaccompanied child to the Department of Health and Human Services’ (HHS) Office of Refugee Resettlement (ORR). UAC are also placed in removal proceedings and issued a “Notice to Appear” in immigration court. UAC from Mexico and Canada: CBP is not required to automatically refer Mexican and Canadian UAC to ORR as some may be permitted to voluntarily withdraw their applications for admission to the U.S. and return to their countries of origin. However, the law does require CBP to screen UAC for fear of return and trafficking, as well as determine whether the child is able to make an independent decision to withdraw his or her application for admission to the United States. For those deemed at-risk or unable to withdraw their application, CBP must transfer the UAC to ORR’s care. ORR Care and Custody: ORR must provide UAC in its custody with food, shelter, and clothing, as well as educational, medical, mental health, and case management services. Family Reunification: UAC may typically reunify with family members and other caregivers in the United States (“sponsors”) while they undergo immigration proceedings. Sponsors include parents, legal guardians, grandparents, adult siblings, aunts, uncles, cousins, and unrelated adults (i.e., family friends). ORR identifies and screens sponsors to confirm their identity and establish that they will be able to provide for the safety and well-being of the UAC. During this screening process, sponsors’ fingerprints and information is shared with the Department of Homeland Security. ORR also provides information to sponsors to help ensure that the UAC attend their immigration proceedings. Home Studies and Post-Release Services: For a limited number of UAC, ORR funds home studies and post-release services by social services providers to help ensure children are released into safe placements and to facilitate family and community integration after reunification. These practices promote child safety and can help reduce the need for involvement with the public child welfare system post-release. Are UAC Able to Access Protection and Legal Relief? Some Forms of Relief for UAC: Some of the children qualify for asylum protection, some for visas as abused, abandoned, and neglected children (Special Immigrant Juvenile Status), and others as victims of trafficking (T nonimmigrant status) or of serious crimes (U nonimmigrant status). Rate of Representation: Non-detained immigrants (such as most UAC) who have counsel are five times more likely than those without legal representation to obtain immigration relief. Nevertheless, UAC are not entitled to court-appointed counsel and often have to navigate the complex legal system alone. As of July 2018, only an estimated 50% of unaccompanied children had representation in cases pending in immigration court. • Become a foster parent for an unaccompanied refugee or immigrant child! USCCB/MRS currently provides foster care to unaccompanied children in the following locations: Texas, Michigan, Arizona, Virginia, New York, California, Washington, Mississippi, Florida, Indiana, Tennessee, Pennsylvania, and Utah. Those interested in becoming a foster parent must meet state and agency guidelines for training and licensing. If you live in one of the aforementioned states and are interested in becoming a foster parent, contact migratingchildren@usccb.org for more information. If you reside in Colorado Springs, CO; Denver, CO; Fargo, ND; Fullerton, CA; Lansing, MI; Newton, PA; Seattle, WA; Washington, DC; or Worcester, MA please contact Lutheran Immigrant and Refugee Services at fosterparentinfo@lirs.org. If there are no USSCB or LIRS programs in your area, please direct your inquiries to DCS_ProjectOfficers@acf.hhs.gov. • Contact your local Catholic Charities affiliate to learn about their material/volunteer needs, including the donation of clothing, hygiene products, food, and cash, as well as tutoring and mentoring opportunities. Apprehensions Fiscal Year 2016, U.S. CUSTOMS AND BORDER PROTECTION, https://www. (last visited Nov. 29, 2018). ,. 4 TVPRA 2008, 8 U.S.C. § 1232(a)(2). areas of need and concern, connection to community services, and referral to legal services. ALIEN CHILDREN IN THE UNITED STATES 9 (AUG. 2018), available at https://www.americanbar. 10 Catholic Charities USA, https://www.catholiccharitiesusa.org/.